Words in brown are hyperlinks to congress website, pdf entry form or contact’s e-mail. Thu-Sun, 4-6 Apr, English Seniors Championships at St John's Hotel, Warwick Road, Solihull B91 1AT. Two categories over-50 and over-65, six rounds, half-point byes available except for final round, 90 min plus 30 sec increment. ECF gold membership recommended. Sat 25 May to Mon 27 May. Cotswold Chess Congress at The King's School, Gloucester, GL1 2BG. Morning rounds start at 10am and there are six rounds. Open, Major (u155), and Minor (u125) tournaments. Half point byes available rounds 1-5, bookstall. 12 Nov. The draw and format for the individual competitions is published. 15 Sep. Entries invited for the Bennett and Ball Cup competitions. Brian Turner (Malvern) has taken the controller's role for the 2018-9 league individual championships for the Bennett and the Ball cups. All members of clubs affiliated to the league are eligible to enter free of charge. 30 Aug. New president appointed at AGM. Paul Sharratt (Stourbridge) is the new incumbent. 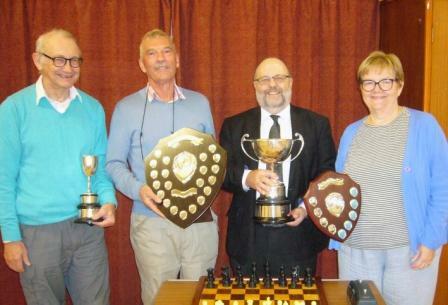 After ten years as organiser, Andrew Farthing stood down as organiser of the Bennett and Ball individual competitions and the post is currently vacant. Fees were unchanged at £5 per club. At the awards ceremony, Ian Clack received the shield for league champions Redditch A, Michele Clack the shiled for Division 2 champions Redditch B, Lee Davis (Malvern) the Bennett Cup and Ray Collett (Worcester) the Ball Cup for their wins in the individual tournaments. At a well attended meeting, secretaries arranged fixtures and heard that Redditch have a new venue at Alvechurch Sports & Social Club and Droitwich now meet on Wednesdays. For older news click the W&D News button on the left. The league was started in 1932. It promotes team and individual chess competition in the district surrounding Worcester. Currently seven clubs and twelve 4-board teams compete in the league events, which are organised in two divisions. The league runs two individual tournaments: the Bennett Cup (open) and the Ball Cup (under-150), which are open to registered players of affiliated clubs. Most of the league business is handled by honorary secretary Andrew Farthing, and President Paul Sharratt manages most of the league’s business. For more information and contacts, use the "About WDCL" menu button on the left.